Although I love everything from lush, I am really enjoying their hair care range at the moment. I’ve made it my mission to try as many products as I can to review for my little lush blog and hopefully find my perfect product in the process. I have recently been trying the I love juicy shampoo. Lush do a variety of different types of shampoos including solid shampoo bars but this is a much more traditional liquid shampoo. From the name I love juicy it was pretty obvious that this shampoo was going to have a very fruity scent. I have however been wrong on scent assumptions before but I was happy to find that I wasn’t this time. Packed full of the most incredible fruity ingredients including mango, lemon, Papaya, kiwi, pineapple and orange this shampoo has a fresh and fruity scent. This shampoo was created with the aim of removing grease from the hair, as I find my hair tends to get greasy very quickly I new straight off I was going to love this product. The array of fruits in this shampoo are packed full of enzymes which break down the excess oil on your scalp leaving your hair lovely and clean. The first time I used this product I was overwhelmed by the amount of foam my head was covered in. Turns out you only need to use a tiny amount of this product as it lathers up incredibly well. !Once washed my hair felt super clean and really fresh and I found the fruity scent really lingered in my hair. 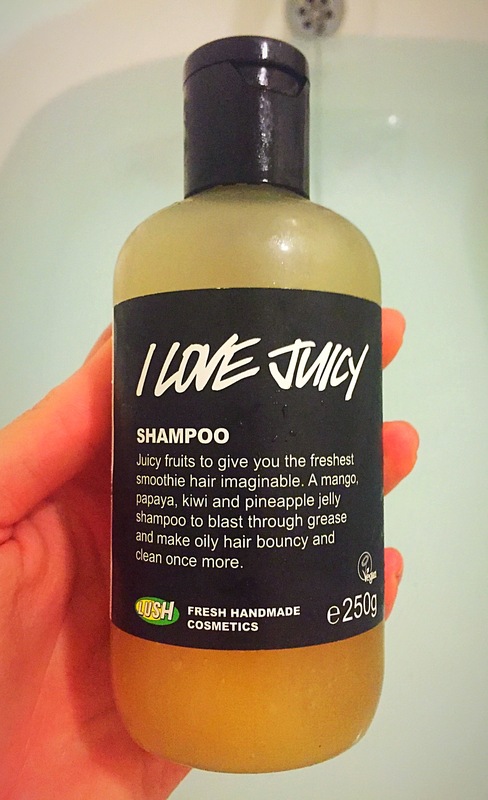 Overall I love the I love juicy shampoo from lush, it smells amazing and I loved how clean my hair felt afterwards. This shampoo will defiantly be getting purchased again in the near future. Top tip- do not get this shampoo in your eyes it really stings!! Ingredients – Water, Sodium Alkyl Sulfate, Ammonium Laureth Sulphate, Cocamide MEA, Propylene Glycol, Perfume, Lemon Oil, Freshly Juiced Papaya, Fine Sea Salt, Carrageenan Extract, Sweet Orange Oil, Fresh Pineapple Juice, Fresh Kiwi Juice, Fresh Mango Juice, Citral, Limonene, Benzyl Alcohol, Methylparaben, Propylparaben. *Please contact lush for a full, accurate and upto date ingredients list. Sounds great! I’ve always been skeptical about Lush shampoos but you have convinced me to try… Thanks!